Peripheral Arterial Disease (PAD) is a very common condition during which peripheral arteries of legs, stomach, arms and head start to narrow. Most commonly it occurs in legs and it’s similar to coronary artery disease (CAD). Both of those conditions are caused by a build-up of fatty deposits. The fatty deposits, called atheroma, are made up mostly of cholesterol and other blood waste substances. The build-up of atheroma on the walls of the arteries makes the arteries narrower which restricts blood flow to the legs in a process called atherosclerosis. The condition affects 9% of the population, but will only cause symptoms or problems in a quarter of affected people. Many people with PAD have no symptoms at all, but some patients will experience symptoms including pain, tiredness and cramping in the leg or hip muscles while walking or climbing stairs. Normally, this pain goes away with rest and returns when you walk again. Many people mistake the symptoms of PAD for something else and sometimes they will go for years without being properly diagnosed by a professional. People suffering from peripheral arterial disease have a much higher risk of heart attack or stroke. Left untreated, PAD can lead to gangrene and amputation of your limbs. Your risk of developing PAD increases, as you get older and it’s estimated that around one in every five people over 60 years old are affected by the condition to some degree. Men tend to develop the condition more often than women and there are certain things that can increase your chances of developing PAD and other forms of CVD, including diabetes, high blood pressure, high cholesterol and smoking. By tackling these risk factors, you may be able to reduce your chances of developing PAD and other types of CVD. PAD is largely treated through lifestyle changes and medication. By tackling risk factors, you may be able to reduce your chances of developing PAD. The underlying causes should also be addressed, such as reducing high blood pressure and cholesterol, and diabetes. 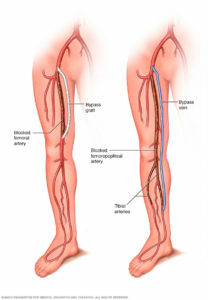 Medication, life changes and in some cases surgery, can be used to improve the blood flow in your legs.